From the New York Times bestselling author of The House at Tyneford comes a captivating 1940s English country novel of a love triangle, family obligations, and rediscovering joy in the face of grief—perfect for fans of Kate Morton and Downton Abbey. New Year’s Eve, Dorset, England, 1946. 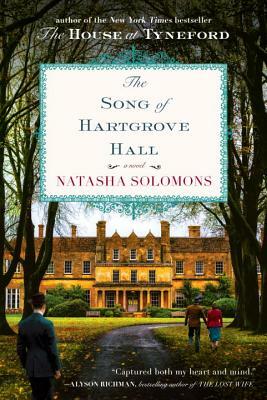 Candles flicker, a gramophone scratches out a tune as guests dance and sip champagne—for one night Hartgrove Hall relives better days. Harry Fox-Talbot and his brothers have returned from World War II determined to save their once grand home from ruin. But the arrival of beautiful Jewish wartime singer Edie Rose tangles the threads of love and duty, and leads to a devastating betrayal. Fifty years later, now a celebrated composer, Fox reels from the death of his adored wife, Edie. Until his connection with his four-year old grandson—a music prodigy—propels him back into life, and ultimately to confront his past. An enthralling novel about love and treachery, joy after grief, and a man forced to ask: is it ever too late to seek forgiveness? A screenwriter and novelist, Natasha Solomons lives in Dorset, England, with her husband and young son. She is the New York Times bestselling author of The House at Tyneford, The Gallery of Vanished Husbands, and The Song of Hartgrove Hall.